A while back I was researching into the rare cases of heart attacks in runners. The most classic in point was the legend of the marathon runner, Pheidippides. It seemed that these articles referred to defects that were never diagnosed. In 2012, I saw a TedX video by a Cardiologist runner, explaining that too much running may be unhealthy. Recently this research popped up again with Dnews. it basically mentions the same thing, more details were available in the Tedx talk. I love running, If I can I would do it everyday, But according to research, I might need to drop it down a notch. Darwin was wrong, it is not the survival of the fittest, it is the survival of the moderately fit. Based on this research, now most of my workout is often not to vigourous, maybe once a week is speed work, once a week long relax run, everything else in moderation, but at least one rest day a week. Generally runners still live 6 years longer than non-runners. But everything in Moderation. I would like to attain and maintain 10km under 1 hour. I told my self that I will do it again another time. I was running relaxed with my wife, her pace not mine. But we did quite well. 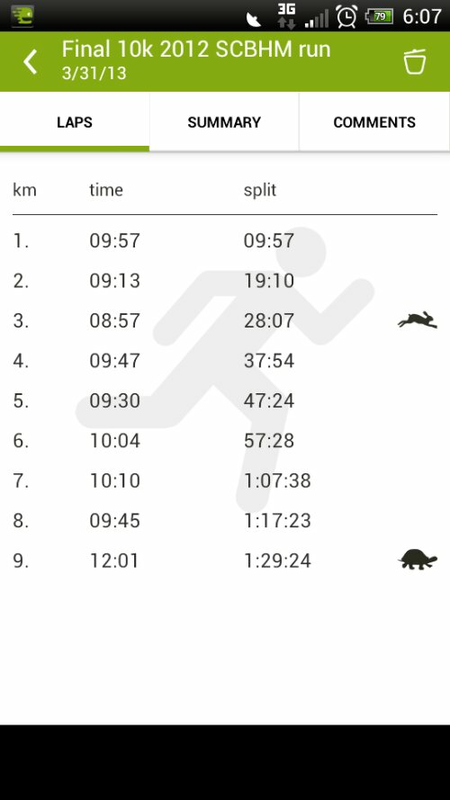 I used endomondo to track my run, unfortunately the app crashed in the last 10k. Looking at the lap times, we definitely could have done better. I’m hoping on the day the huge amount of ppl will get us pushing ourselves faster a bit more. I have been meaning to post this for a while now. When I run or when I drive around and see people run, I have the urge to discuss with them on what is the safe method of running on the road. The following are my own logical thoughts. Be aware. Run against the traffic. Be able to see the road and other road users. It is safer because you get to see the incoming traffic, so you can react if you have to. You cannot expect every driver to be considerate and focused on the road. the only time that running with the traffic is allowable is during mass runs. This is because during these runs the polis and ambulance escorts are around. Be visible on the road. Wear light coloured or contrasting striped clothing, this is in order for the other road users to be able to see you. At nite wear reflectors or blinking lights, there are certain running shoes that already reflectors. I have even seen some people having lighted shoelaces. Be considerate, run to left of the side walk. Useful when dealing other runners who are not running with the traffic. This is for their safety, I can clearly see the traffic that they don’t. Exceptions are when they seem to stubbornly want to that lane, or don’t see me coming. In that case give them way. I don’t want them to avoid me by going into the road, while not seeing the car behind them and getting into an accident. Plan your routes. Try to see which paths reduces the risk of crossing road lanes. Interestingly, going against the traffic tends to fulfil this objective. Keep safe. Especially when you need to cross the road. Look both sides before crossing. If crossing a junction with a car going out, make eye contact and signal them, if not just go behind them. I was actually training for the half marathon, and then I want to join an upcoming labuan cross channel swim. For run training I have been using High Intensity Interval Training based on the Four Hour Body which I also based my diet nowadays. The training is basically a 2.4km run in the following effort and timing. Landing on the balls or flat on my feet BUT NOT on my heels. Using my centre of gravity to lean me forward and “catch” myself when I fall forward, rather than pushing using my back leg. Also I recently bought online a watch that can count my laps. it’s called poolmate. so now I know how fast, far and efficient I have been swimming with the total immersion technique. The last one I did was 5.5km in 2hours and 2minutes and 59 seconds. I feel like I can take up a triathlon :p I just need to take up cycling again. where can I get a good cheap one? hmmm… when and where’s the next one?